Anyone else LOVE the photo booth at Brit Mums Live 2012? You know the one where you got transported to Orlando, and then clicked your Dorothy heels and all of a sudden you were back in the room. 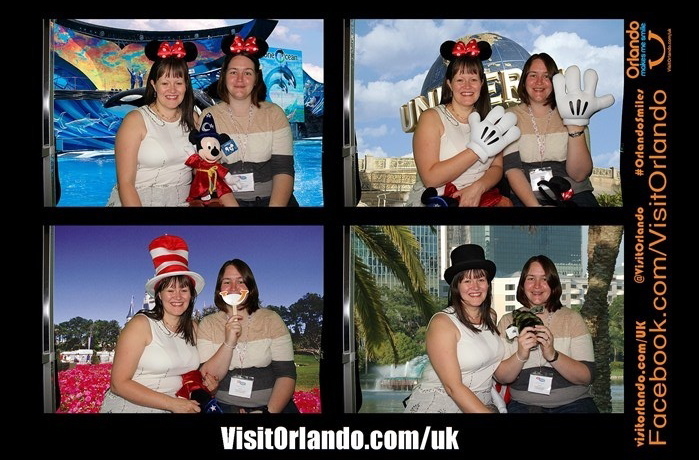 This is me and Jenny's trip to Orlando - I just LOVE Disney. I am also very excited to see that Jenny now has the URL for Treading on Lego - coolest blog name around! Well done Jen! You could travel the world like your trip to Orlando. Not spend a fraction of the cost and have all the photos as evidence - brilliant! Re your Japan photos in a packet, I have one word for you: scan. If you can't do it yourself most photo place will put your old photographs on disc for you. Thanks for your comments - you make me feel less lonely. I never take them for granted sweetheart - thank you. Can't believe you posted this up! You should definitely scan your photos. I've been scanning all my old holidays and Uni ones and I love looking at them.